One of Japan’s top artists has changed the way the landmark French museum will display its contemporary art. One of Japan’s most celebrated artists, Takashi Murakami, has often been compared with the late Andy Warhol for his ability to transform pop culture to appeal to 'high-brow' audiences. And his work has certainly proven marketable with deep-pocketed international fans, who have shelled out millions for his pieces over the years. One of the most notable examples was the headline-making sale of one of his sculptures, sold at a Sotheby’s auction in 2008 for an unexpectedly high $15 million. The 1998 work, titled ‘My Lonesome Cowboy,’ is a large fibreglass and iron figure of a naked young anime-esque male masturbating. Now the unconventional but successful Japanese artist, who works with various kinds of art forms including painting and digital media, has altered the way one of France’s most prestigious landmarks displays contemporary artwork. The Palace of Versailles announced last month that it will no longer be using its royal apartments for exhibition space after strong protests arose over Murakami’s works being displayed there from early September. 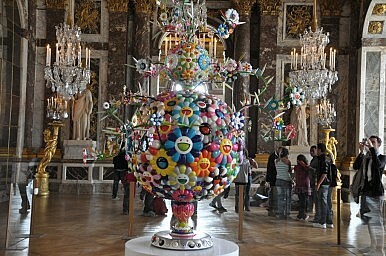 According to AFP, it’s Murakami’s metal, fibreglass and acrylic sculptures, ‘outlandish manga visions’ such as ‘a big-bosomed French maid’ and a ‘Pepsi-guzzling monster,’ that are deemed by some to be simply too outrageous for the esteemed and historic Chateau of Versailles. The Murakami exhibit, though, will continue through December…for now.